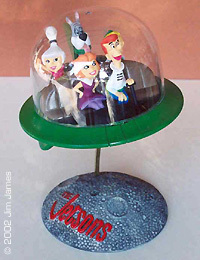 The following are reader's opinions of the Jetson's Spaceship made by Polar Lights. Comments I guess I've always been just a "Mild" Jetsons fan, but I've always loved their floating "Cloud Cities," and their vehicles. So, I naturally dig this little space car. I,ve only tinkered with the pieces, and just temporarily fit the model together. But so far their are no problems with the fit of the few pieces that make up this kit. The clear dome is perfect, and without a scratch. The only things wrong with this cute little treasure are the propulsion units and the rear fin. They are a little on the clunky side, but could easily be fixed or refabricated to soot the builders tastes. Some of the parts in this model will also be great for kitbashing. I really like the lower saucer half, a nicely turned piece with really neat compound curves. I'll definitly be buying a couple more of these kits for the "Chop Shop." The neat thing about this kit is that it's so relaxing. It's nice just to open the box and throw the kit together knowing that it'll turn out great. Try as you may, they're aren't a lot of things you can do to improve this kit. The only problem I found was the gaps around the engine(?) tips and fins but these were easily filled. I made two slight modifications. I painted the exhaust smoke since I'd never seen clear smoke. Although it's possible this could happen in the future, painting the exhaust eliminated the need to hide the seam in this clear part. 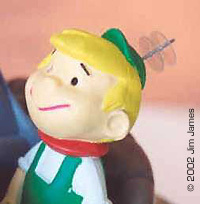 I added antenna to Elroy's beanie by driving a pin into his head and adding two circles of clear styrene cut out with a hole punch. I also thought the stand was too tall and replaced it with a brass rod. This meant that I had to fill the slots in the stand and bottom of the hull which I did with sprue and putty.